Sports Performance 18 Elite didn’t get a bigger hammer. It got a pile driver. After snapping Asics Munciana 18 Samurai’s 56-match winning streak in Round 3 of Gold pool play on Wednesday, the crew from Aurora beat the defending national AAU champions a second time 24 hours later, 25-23, 12-25, 15-11, to win the 18 Open division championship of the 45th AAU Boys and Girls Junior National Championships in Orlando, Florida. This after SPVB 18 Elite dropped two of its first five matches – 25-26, 25-22, 17-15 to Asics Indiana 181 Elite and 30-28, 24-26, 16-14 to Lexington United 18 Adidas – and teetered on the brink of elimination from medal contention. “At this point of the season, it’s all about how you’re going to finish and having to go through those bumps and bruise,” SPVB 18 Elite assistant coach Seth Salmon said. “Whether it was jitters, nervousness … as ugly as those first two days were, you just have to keep trying to push through and play clean enough volleyball to stay in contention for a medal,” he added. SPVB 18 Elite not only stayed in medal contention, it walked off with the biggest prize of them all. 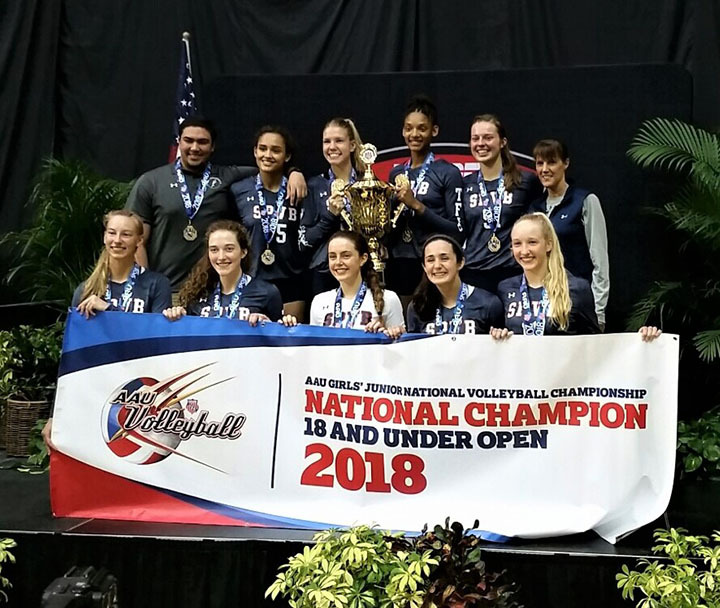 The national title was the fifth in six years for SPVB 18 Elite and the eighth overall in 2018 for Sports Performance in Orlando. The club also claimed titles in the 18 Premier, 18 Classic, 16 Classic, 16 Aspire, 15 Open, 15 Premier and 15 Aspire divisions. 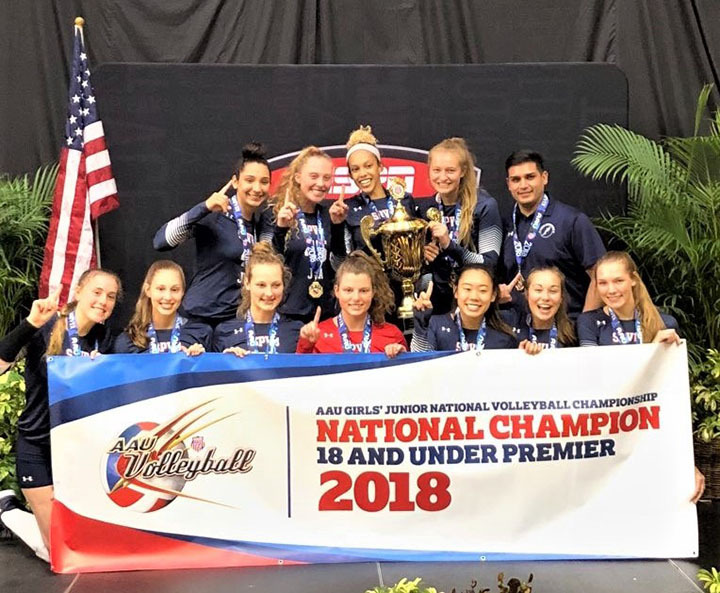 Sports Performance claimed four of those titles Thursday, but none was bigger than the one that came at the expense of Asics Munciana 18 Samurai, by some accounts the best 18s team in the country. “We knew that since we were the first 18s team that beat them, the second time around when we punched they would punch back even harder,” Salmon said. “We knew they would come at us harder, serve tougher, hit harder and be more aggressive. SPVB 18 Elite’s 6-foot-4 outside hitter Taylor Landfair from Plainfield Central was named MVP of the 18 Open division. She was joined on the All-American team by teammates Emmy Barnhorst, a 6-3 middle from Wheaton North, and 5-8 libero Grace Kloss from Waubonsie Valley. Other members of the national championship team are 6-3 middle hitter Sammi LaBolle from Sandwich, setters 6-foot Allison Van Eekeren from Benet Acsdemy and 6-1 McKenna Slavik from St. Charles East, and 5-7 defensive specialist Elizabeth LaBue from Wheaton North. Also, 6-1 outside hitter Hanna Lesiak from Lincoln-Way East and 6-2 outside hitter Natalie Mitchem from Bolingbrook. Joining SPVB 18 Elite on the winners podium Thursday was SPVB 18 Kahl, which defeated Asics Munciana Quora 25-21, 25-23 behind MVP Kyra Slavik of St. Charles East to finish 12-0 and claim the 18 Premier division championship. Alison Jennings, a 6-foot middle hitter from Oswego East, and Sarah Kushner, a 5-10 outside hitter from Naperville North, were also named to the All-American team. Other members of the 18 Premier division championship team are 6-3 middle hitter Annika Clark from Wheaton North, 5-11 outside hitter Gisela Bode from Waubonsie Valley, 5-10 setter Grace Brock from Plainfield Central and 5-7 libero Grace Green from Marist. Also, 5-9 outside hitter Isabelle Todd and 5-8 defensive specialist Katherine Shook from Plainfield Central, 5-7 libero Michelle Lee from Waubonsie Valley and 6-foot outside hitter Tyra Burton from Naperville North. Sports Performance also brought home a pair of national titles in the 16s age group. SPVB 16 Blue defeated Kokomo Volleyball 16-2 25-20, 25-21 to finish 13-0 in the 16 Classic division, and SPVB 16 White edged another Illinois entry, Club 1 16 Red, 27-25, 23-25, 19-17, to finish 13-0 and win the 16 Aspire division. SPVB 16 Blue’s Quiara Dunson, a 5-foot libero from Plainfield Central, was named MVP of the 16 Classic division. Joining her on the All-American team were teammates 5-11 middle hitter Rianna DeMyers from Waubonsie Valley and 5-9 outside hitter Amee Beedle from Wheaton North. Other members of the 16 Classic championship team are 5-7 defensive specialist Anna Hyde from Wheaton Academy, 5-10 outside hitter Annika Altekruse from Metea Valley, and 5-8 setter Elizabeth Wirth from Keith Country Day. Also, 6-foot middle hitter Eva Topolewski from Neuqua Valley, 5-9 outside hitter Kira Beers from Naperville Central, and 5-10 outside hitter Carly Richards from Naperville North. SPVB 16 White’s Trinity Evans, a 5-8 outside hitter from Waubonsie Valley, was named MVP of the 16 Aspire division. She was joined on the All-American team by teammates 5-7 libero Jessica D’Ambrose from Addison Trail and 5-9 outside hitter Aidan Brown of Sterling Newman Catholic. Other members of SPVB 16 White are 5-6 libero Ellie Griffiths of Naperville Central, 5-11 middle hitter Emma Tacchia of Joliet Catholic, 5-10 defensive specialist Lilly Smith of West Chicago, and 5-9 middle hitter Linnea Anderson of Neuqua Valley. Also, 5-3 defensive specialist Natalie Newman of Hinsdale Central, 5-11 setter Olivia Szylar of Lake Park, 5-9 setter Piper Drazek of Geneva and 5-10 outside hitter Olivia O’Keefe of Neuqua Valley. Lillian Summers, Alexandrea Jansen and Maddie Bylak of Club 1 16 Red were also named to the 16 Aspire All-American team. Other members of Club 1 16 Red coached by Cory Sackett are Anna Gawron, Jenna Griffith, Erin O’Grady, Alaina Que, Isabella Ray, Hannah Rubino, Hailey Sperling and Natalie Stefanski. In the 16 Open division, SPVB 16 Elite advanced to the semifinals only to fall to eventual national champion OT 16 S. Roberto, a team out of the Tampa Bay, Florida, area, 25-17, 25-14. SPVB 16 Elite finished 11-1 and tied for third place. SPVB 16 Elite’s 5-5 libero Hattie Monson from Benet Academy and 6-foot setter Melissa Walden from Waubonsie Valley were named to the 16 Open division All-American team. Other Illinois players named All-Americans Thursday are: Hannah Oehlberg of Club Fusion 18 Black and Emily Naubert of Wildcat Jrs. 18 Black in the 18 Premier division; 1st Alliance 16 Red’s Grace Asleson and Shelby Stefanon in the 16 Club division; and SPVB 16 Navy’s Darlene Zediker and SPVB 16 CTE’s Brelsen Reid in the 16 Classic division. Other Illinois teams that finished in the top 10 of their respective divisions Thursday were: Club Fusion 18 Black and Wildcat Jrs. 18 Black, tied for fifth place in the 18 Premier division; and 1st Alliance 16 Silver, tied for ninth in the 16 Open division. Also, 1st Alliance 16 Red, tied for third in the 16 Club division; SPVB 16 CTE and SPVB 16 Navy, tied for fifth place in the 16 Classic division; and New WAVE 16 Hurricane and D1 Elite 16 Green, tied for ninth in the 16 Classic division.